For most people, the word “Bosnia” conjures up memories of the heart-breaking footage during the 1990s Bosnian War. And beyond that, most people know little else about this mysterious country. That’s why visiting the ethnically diverse Bosnia and Herzegovina is bound to be an eye-opening experience. Situated in southeastern Europe, this exotic land is 40 percent Muslim, 31 percent Orthodox, and 15 percent Roman Catholic. The landscape of Bosnia and Herzegovina is embellished with mountainous terrain, medieval villages, and Muslim and Christian architecture. Sarajevo is a fascinating city to visit. Be prepared to be blown away by this ethnically diverse city and its friendly people! The capital city Sarajevo is a leading cultural centre in the Balkans, boasting a long and rich history of religious and cultural diversity. Adherents of Islam, Orthodoxy, Catholicism, and Judaism have coexisted in the city for centuries, earning Sarajevo the nickname “Jerusalem of Europe”. Sarajevo lies in a valley in the middle of the Dinaric Alps. Five major mountains—Bjelasnica, Igman, Jahorina, Trebevic and Treskavica—form a spectacular backdrop for the city, through which the turquoise river Miljacka runs. Old towns dot the lush green hills that flank the city’s outskirts. Once a major city, Sarajevo was the first city in Europe to build an electric tram network in 1885, and was also host to the 1984 Winter Olympics. The scars of the Serbian Siege during the 1992-1995 Bosnian War—the longest siege on a city in modern history at 1425 days—are still evident in Sarajevo. Bullet holes can still be clearly seen on some of its buildings, reminding us about the cruelty of war and its impact on the people. Sarajevo represents a collision of Eastern and Western cultures. Traces of the Eastern Byzantine and Ottoman empires and the Western Roman, Venetian and Austro-Hungarian empires can be found across the city. Vibrant architecture from the Ottoman era is juxtaposed with Austro-Hungarian buildings and Christian and Jewish edifices. While in the city, one can hear the sound of mosque prayer calls interspersed with the distant chime of church bells. For a brief second one wonders if they are in Europe or in the Orient! The Sarajevo old town Bascarsija, which means primary market in Turkish, is an old Ottoman bazaar and the city’s historical centre. Lining the bazaar’s cobbled streets are many souvenir shops, sweet shops and cafes. Visit the famous Baklava Shop (Curciluk veliki 56, Sarajevo 71000) at the Old Town for a taste of baklava. These decadent pastries, which were introduced to Bosnia during the Ottoman era, consist of layers of filo filled with chopped nuts and coated with sweet syrup or honey. A stroll along Coppersmith Street—one of Bascarsija’s oldest streets—transports one back to the 16th century when the country was under Ottoman rule. Here, intricate Ottoman crafts including metalwork, jewellery, and pottery can be found on sale. Ranging from ornately engraved bracelets and jewellery to aesthetically pleasing coffee sets, each copper piece is carefully moulded and embellished with enamel and rubies. “Let’s meet at the Sebilj fountain!” That’s right! This wood-and-stone fountain with a green domed roof resembles an oriental gazebo, and is a popular meeting place for locals as well as pigeons. Also known as pigeon square, the Sebilj fountain is often surrounded by pigeons and stray dogs. There were once over 300 fountains in Sarajevo during the Ottoman era, but most of them were destroyed in a fire during the 17th century. The Sebilj fountain was later built in 1753, and relocated and rebuilt by Czech architect Alexander Vitek in 1891. As a Bosnian legend goes, you will soon return to Sarajevo if you drink the water from the Sebilj. The word Sebilj is Arabic for “road”, and implies “a building that supplies fresh water on the path”. Address: Bascarsija, Sarajevo 71000, Bosnia & Herzegovina. The Sarajevo Roses are concrete scars caused by mortar shell explosions during the Siege of Sarajevo. During that period, the city was bombarded with over 300 devastating shellings daily by enemy forces. These marks were later painted with red resin, and they resemble red roses or blood stains. They serve as memorials for those killed during the tragic Bosnian War. But those sad days are over, and Sarajevo is slowly recovering. The Sarajevo Roses are gradually disappearing as the city rebuilds itself. Time will eventually heal all pain, but the remaining Sarajevo Roses are vivid reminders of the cruelty of war, and the suffering inflicted on the citizens of Sarajevo. Although Bosnia had been under the Ottoman rule for centuries, you can never call their coffee Turkish—in fact, Bosnians consider it an insult to say that “Bosnian Coffee is Turkish coffee”. Bosnians take great pride in their coffee, and consider it an integral part of their identity. Bosnian coffee has a thicker foam, more bitter taste and a somewhat stronger flavour compared to Turkish coffee. In the cafés along Bascarsija, Bosnians—both young and old—gather at tables, sipping local coffee served on metal trays. The hot coffee is served in engraved traditional metal pots, along with a dish of sugar cubes. Learn the local way of taking sugar with your coffee—instead of plopping it into your cup, dip the corner of the sugar cube into the coffee quickly, then take a small nibble and let the sugar dissolve in your mouth as you sip your coffee. The beautiful pseudo-Moorish facades of Vijecnica are a remnant of the Austro-Hungarian occupation. Officially opened in 1896, the building initially served as a City Hall, before being converted into the National and University Library of Bosnia and Herzegovina in 1949. On the fateful night of 25 August 1992, fire ignited by grenades ripped through the historic library building. The intentional fire destroyed the building and 90% of its collection of 2 million books, including literature recording the country’s multicultural life under the Ottoman and Austro-Hungarian empires. In 2014, with the assistance of UNESCO, this iconic landmark was restored to its formal glory. Be enthralled by the building’s orange and yellow motifs, the Islam-influenced arches and its hand-painted stained-glass ceiling. The entry fee is KM2.00 (US$1.1). Address: Obala Kulina bana, Sarajevo 71000, Bosnia & Herzegovina. The Yellow Bastion and White Bastion are part of the old walls which protected the city. Located high up on the hills, you can get the best view of Sarajevo at these two historical fortresses. The Yellow Bastion or the Zuta Tabija is probably the best place in Sarajevo to watch the sunset. The stunning panoramic view of Sarajevo from the Yellow Bastion will take your breath away. To reach the Yellow Bastion, you have to pass through the Kovac i Cemetery near the Sebilj fountain. The Kovac i Cemetery is the resting place for the young men who had lost their lives during the Bosnian war. A simple open-air café sits at the Yellow Bastion. At about ten minutes’ walk away is the White Bastion. An ancient fort overlooking Sarajevo, the White Bastion (Bijela Tabija) is a national monument of Bosnia and Herzegovina built in 1550. Situated at the top of the Vratnik hill at an altitude of 667m, you can admire the arresting panoramic view of Sarajevo, with its red roofs and ancient mosques. Situated in Bascarsija’s Stari Grad municipality, this impressive dome-shaped monument is one of the most iconic Ottoman structures in the Balkans, and the most popular place of worship in Bosnia and Herzegovina. 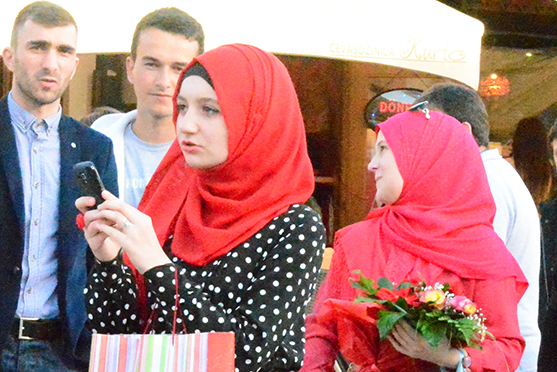 The chanting of prayers resonates throughout the Bascarsija neighbourhood, while graceful Bosnian women dressed in colourful Hijabs and vibrant long garments gather in the square. Built in the centre of Bascarsija since 1530 by famous Ottoman architect Adzem Esir Ali “Alaüddin”, Gazi Husrev-beg Mosque is open to visitors. It is advisable for women to dress appropriately. Address: Saraci 8, Sarajevo 71000, Bosnia & Herzegovina. Latin Bridge was famously known for being the assassination site of Archduke Franz Ferdinand (the heir to the Austrian throne) and his pregnant wife. The assassination, which took place on 28 June 1914, sparked one of the greatest tragedies in modern history—World War I. This Ottoman-era bridge has stood over the River Miljacka since 1798. Address: Stari Grad Sarajevo, Sarajevo 71000, Bosnia & Herzegovina. After the communist government of Yugoslavia fell in 1990, Yugoslavia split into six independent countries—Slovenia, Serbia, Croatia, Montenegro, Bosnia & Herzegovina and Macedonia. The Bosnian war from 1992-1995 was fought to maintain the country’s independence. During this period, Sarajevo was completely surrounded by Serbian forces on all side. The siege lasted for almost 4 years, during which the only access to the outside world was this tunnel. Also known as the Tunnel of Hope, it linked the city to the neighbourhoods of Dobrinja and Butmir. The tunnel served as the only way in and out of the city during the war, allowing food, war supplies, and humanitarian aid to come into the city, and for people to get out. The tunnel museum has a small exhibition displaying war photos, newspaper clippings, weaponry, and a short film about the war. The museum was built after the war, and serves as the entrance to a short section of the 1m wide, 1.6m high hand-dug tunnel built under the airport runway. The highlight of the museum is the opportunity to enter the tunnel, whereby visitors can crawl through 20 metres of the original 800-metre long dark tunnel, and gain some insight into the dreadful Bosnian war. Looking at some of the displays at the museum was both heart-wrenching and sobering. The people struggled in many ways—fearing for their lives and figuring out ways to survive. Address: Tuneli 1, Sarajevo 71000, Bosnia & Herzegovina. The Sacred Heart Cathedral or the Cathedral of Jesus’ Heart was consecrated in 1889. This neo-Gothic architectural-style cathedral is infused with Romanesque elements and situated in Ferhadija Street just outside Bascarsija. Made of yellow sandstone and reddish lime-stone, the cathedral has two bell towers that are 43.2 metres high. The Sacred Heart Cathedral remains a distinctive icon of Sarajevo’s skyline in this Muslim-dominated country. You can also find the famous Sarajevo Roses around the Cathedral. The cathedral is open daily and there is no entrance fee. Address: Trg Fra Grge Martica 2, Sarajevo 71000, Bosnia & Herzegovina. Park Princeva is a restaurant hidden in high up Sarajevo—above one of Sarajevo’s oldest neighbourhood located on the river Miljacka. Due to its fantastic location, this restaurant has been a favourite gathering venue for poets, bohemians and travelers, it has received many important guests, including actor Richard Gere, and magician David Copperfield! Dine at Park Princeva for an unforgettable experience, while admiring the beautiful and panoramic view of Sarajevo. Address: Iza Hrida 7, Sarajevo 71000, Bosnia & Herzegovina.